Pattern: Toe-Up socks with an afterthought heel. Yarn: So many TFA scraps I don’t even know where to start! About once a year I try to knit a pair of socks for my older brother Luke. 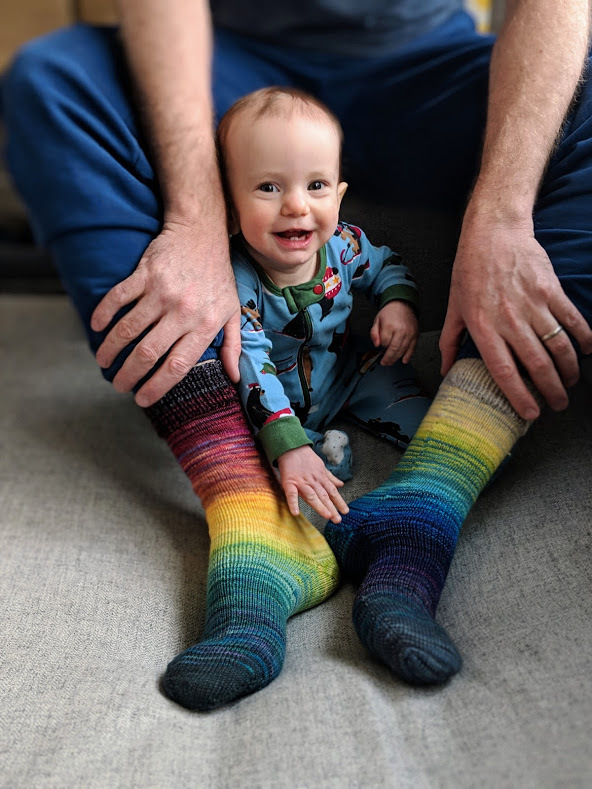 I don’t knit socks for everyone in my family every year, but Luke is a special case because the socks I knit for him literally save lives!!! Sort of… Luke is a doctor, more specifically he’s a Urologic Oncologist and he does this specialized surgery that, from what I understand (which is clearly not much) involves robots that he controls with joysticks. Ha! He’s going to kill me when he reads this because I’m certain I’ve got it all wrong! So, the first time he did this surgery he was wearing hand knit socks (he’s not standing over the patient, he’s sitting at a desk operating the “robots”) and the surgery went really well and since surgeons are notoriously superstitious he will now only wear hand knit socks while doing this type of operation. So I knit him socks to save lives. Luke and I are both basically heroes.